I ordered this marian dalmatic at short notice for a friends ordination. The delivery turn around from order to receipt was fantastic and I was absolutely delighted with the fabric and the over all " look" of the dalmatic. A beautiful garment and great value. 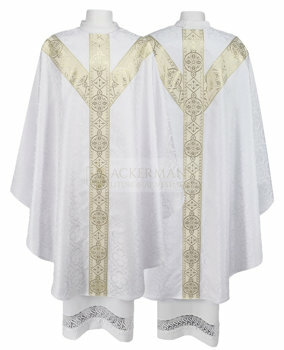 we are very happy with the quality of your vestments, the embroidery, fabric and trimmings. It's more beautiful than pictures or web site shows it. thank your ackermann store!